EUA, Segredos Técnicas Receitas de Culinária, Maravilhas; Aprenda a Fazer Deliciosos McDonald's, Burger King e Taco Bell: Veneno NH3 Hidróxido de Amonia Mais Gorduras Mais Comida de Cão Igual a Venenosos Hambúrgueres Americanos! Multinacional Rede de Fast Food do Bilionário Warren Buffett Mudou Receita Após Denúncia Jamie Oliver's, Famoso Chef de Cozinha Britânico do Programa de TV Naked Food Revolution: "70% Carne Americana Leva Amoniâco"
A rede de fast-food McDonald's anunciou que mudará a receita de seus hambúrgueres nos Estados Unidos. A mudança acontece pouco tempo após o chef de cozinha britânico Jamie Oliver descobrir e mostrar em um programa de TV que a rede usa hidróxido de amônio para converter partes gordurosas de carne em recheio para seus produtos, segundo informações do Mail Online. McDonald's have altered the ingredients after the Naked Chef forced them to remove a processed food type that he labelled 'pink slime'. 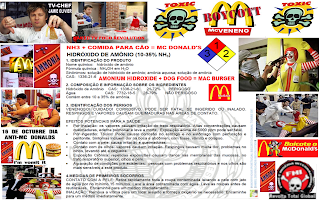 The food activist was shocked when he learned that ammonium hydroxide was being used by McDonald's to convert fatty beef offcuts into a beef filler for its burgers in the USA. 'Basically, we’re taking a product that would be sold at the cheapest form for dogs and after this process we can give it to humans' said the TV chef. Jamie showed American audiences the raw 'pink slime' produced in the ammonium hydroxide process used by producers named Beef Products Inc (BPI). 'Pink slime' has never been used in McDonald's beef patties in the UK and Ireland which source their meat from farmers within the two countries. Now after months of campaigning on his hit US television show McDonald's have admitted defeat and the fast food giant has abandoned the beef filler from its burger patties. 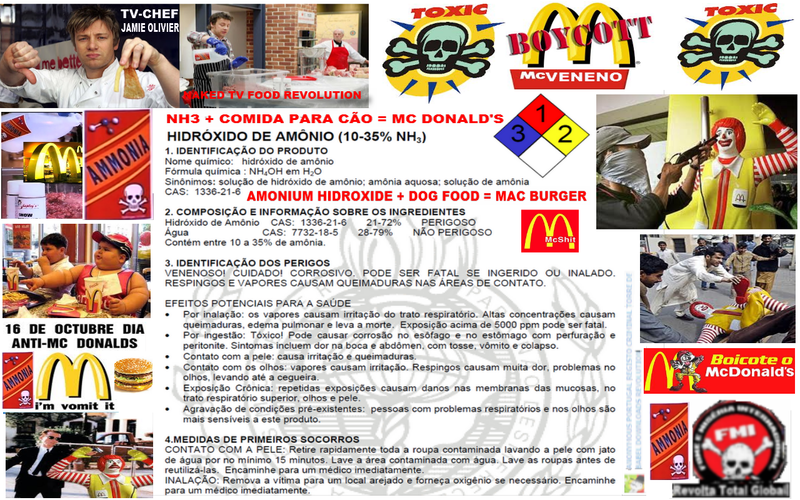 The defiant chef is pleased at the decision by McDonald's stop using the ammonium hydroxide processes meat. He said: 'Why would any sensible human being want to put ammonia-filled meat into their children's mouths? McDonald's denied its hand had been forced by Jamie's campaign. Todd Bacon, Senior Director of U.S. Quality Systems and Supply Chain with the fast food chain, said: 'At McDonald's food safety has been and will continue to be a top priority. 'The decision to remove BPI products from the McDonald's system was not related to any particular event but rather to support our effort to align our global beef raw material standards. In 1999 Jamie Oliver began his TV chef career in the British TV series 'The Naked Chef.' He was awarded an MBE for his services to hospitality. But his healthy eating crusade, hasn't always gone smoothly in the U.S.